Fashionistas! Do-gooders! Art lovers! You’ll all love the Fall 2013 Trunk Show happening at Roe Wolfe on Thursday, Aug. 29, from 10am-7pm. Come see the new fall fashions at the boutique, and if you purchase denim from Henry & Belle, the company and Roe Wolfe will donate 20% of the sale to Make-a-Wish Minnesota. Win-win! There will also be a cocktail reception, and you can meet Chelsea Lankford of zippedblog.com from 4-7pm. If that’s not all, you can also enter to win a free pair of Henry & Belle denim! Oh! And while you’re there, check out the gallery wall near the back of the boutique, where my State Icons are hanging in all their glory. More than 100 of them, in fact! I haven’t known Ashley Kilcher long. The owner of the clothing, makeup, and home boutique Roe Wolfe in Minneapolis came as a guest to the HAMMS (Help a Minnesota Maker Succeed) Event this past April, and stopped by my booth. It was funny, because I had been thinking about contacting Roe Wolfe about possibly carrying my work, and there she was, handing me her business card because she wanted my State Icons in her boutique. It’s like she read my mind! Since that time, my little illustrations have been a smash hit at Roe Wolfe, and through Nov. 1 you can actually find my entire collection—more than 100 State Icons—on the boutique’s gallery wall. Also in that short time, Ashley and I have become not only business partners, but friends. I got much more than I bargained for back in April, and I couldn’t be happier. Ashley Kilcher, owner of and makeup artist at Minneapolis-based boutique, Roe Wolfe. Hey Ashley! Tell us about you. I’m a born and raised Minnesotan, and grew up just outside of the Twin Cities. One of my first jobs in high school was at a hair salon, and I had a manager there who, after work, taught me to cut hair. I went to college for a bit, then decided to go to beauty school. I went to Scot Lewis in Bloomington, and while I was there, I took some makeup workshops from James Ryder. I was invited to his intensive course in Los Angeles, and my love for makeup continued. I worked in a salon for short while after school, and then at MAC Cosmetics. I wanted to get into runway, so I answered an ad for a show. I emailed the lead, asking for an opportunity to assist. After my husband and I had our first baby, I stayed home and continued to freelance for a few years. Most of my freelance work was in the fashion world, and two years ago, after collaborating with another artist, Roe Wolfe was born. [We opened the shop in Mendota Heights, and it] was a place to center my makeup work and love for fashion. Tell us about Roe Wolfe. We moved the boutique from Mendota Heights to Minneapolis this summer, and we’re loving the new location! It’s bigger, and has a brighter feeling. We love having a location where our clients can come in with or without an appointment to check out makeup and clothes. I think we took the best parts of a department store and the best parts of a boutique, and fit them in one place. We are only brick and mortar right now, but we would love to offer an online store in the future. On the makeup side, we do applications and consultations in-store and on location. We do lots of bridal, corporate, and print work. Roe Wolfe is mostly staffed with makeup artists, and although we have some ladies that can assist, they don’t do full applications yet. Most of the time, if you’re looking to have your makeup done, you’ll be helped by Jacqueline or me. Jacqueline has been with Roe Wolfe from the start, and is an amazing artist. The other main piece to the store is the clothing. I’ve always been into fashion, and love being able to share that through the store. My favorite brand is the Pendleton Portland Collection. It’s Pendleton’s contemporary brand, and the line is in its third season. The new fall items will be shipping into Roe Wolfe soon. I’m also in love with the Chicago-based Henry & Belle denim. The jeans feel like butter, and the company gives part of each sale to charity. Roe Wolfe is hosting a Trunk Show with H&B on Aug. 29. 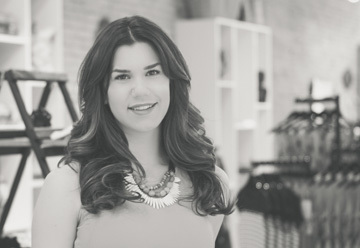 Chelsea from zippedblog.com will be there from 4-7pm for a meet & greet and fashion advice. We’re donating 20% of all denim purchases to Make-a-Wish Minnesota. What’s the best part of being a small business owner? For me, it’s meeting and networking with other small businesses. It’s so inspiring to hear their stories, as well as their struggles. There are so many great small businesses and brands in Minnesota, and so many are women-owned. I think the hardest part is balancing mom-life and work-life. As an entrepreneur, I’m my own boss, but that also means I dedicate loads of time and energy to the store. I’m grateful my girls are proud of the store, and love to come hang out! And now I have to ask, what are your favorite pair of shoes? My favorite shoes are my Coclico booties. They have delicious wood soles, and are handmade in Spain. We’ll bring shoes back into Roe Wolfe later this fall, and I can’t wait! We have some cute booties on the way…. Want more? Subscribe to my monthly emails here.